Dr. D posted this satirical ad in London as part of a wave of criticism News Corporation boss Rupert Murdoch and his staff are facing over the News of the World phone hacking scandal. Staff at the 168-year-old tabloid newspaper - which was recently killed off - have been accused of hacking phones of British celebrities, royals and a even dead teen. Dr. D's ad is a play on words, with references to Hitchcock's film Dial M for Murder and a more recent TV series called Dial M for Murdoch. "A telephone operator becomes an amateur detective after overhearing a woman apparently being killed." Also in the ad, a police officer also wears a phone where a badge would normally be. 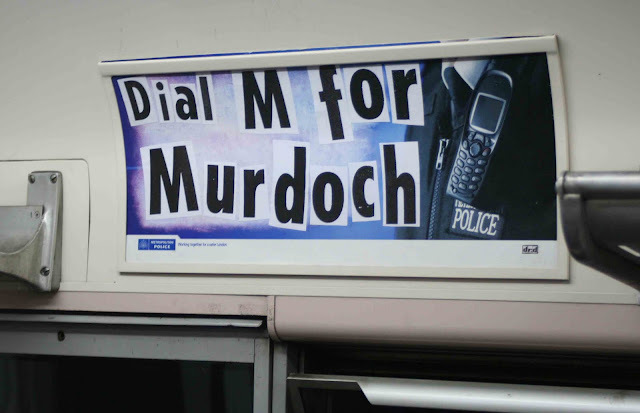 This references British police who were allegedly complicit in the scandal and took bribes from Murdoch employees. Unless corrupt news makers are reined in, Acid Midget may eventually become a 'street art blog made with a hacked iPhone'.